RF bypass for tuning from 24 – 1600 MHz – use as a regular RTL-SDR! Two microSD card holders – for boot and storage! USB wifi dongle (not shown) – STA+ AP mode capable! Lots of LEDs! and Switches! Fully mainline (4.10) Kernel and (2017.01) Uboot support! This is a fully-integrated SDR receiver – RF frontend, SDR, Compute, Wifi – Everything! Outernet is an L-band satellite service that aims to be a download only “library in the sky”. Currently they are broadcasting from Inmarsat and Alphasat geostationary satellites which can be received from almost anywhere in the world. We have a tutorial on receiving and decoding their signal here. Every day almost 20 MB of data is sent down, and this includes data like news, weather forecasts, APRS, wikipedia articles, books and more. In the future you will be able to pay to upload private files or messages. This could be useful for sending messages to people isolated from cell phone reception, or for operating remote hardware. 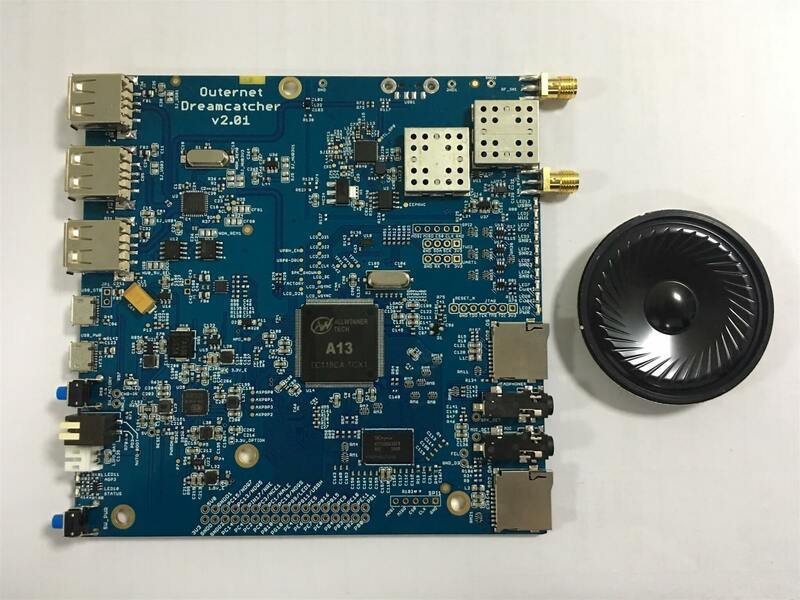 Previously Outernet sold a DIY version of their receiver which included an RTL-SDR V3 or E4000 dongle, LNA+filter, a C.H.I.P embedded computer, and a patch antenna. Recently they have changed to their custom RTL-SDR hardware which is called the “SDRx”. The SDRx includes the RTL-SDR, LNA and filter on a single PCB. Over time it seems that they are moving in the direction of integration of all components onto a single PCB and this can be seen in the Dreamcatcher which now also includes the computing hardware. This is especially good news as the $9 C.H.I.P computing hardware has been almost impossible to acquire since its release. The Dreamcatcher looks to be also not just useful for Outernet, but also for general projects that can be done on embedded hardware as there is a port which bypasses the L-Band filter. Back in 2014 we posted about the XiOne. This was also to be an RTL-SDR and computing hardware built onto the same PCB. It would have been controlled via a WiFi connection and apps on a smart phone/tablet. Unfortunately the XiOne Indiegogo crowdfunding campaign never reached its target so the project faded away. The Dreamcatcher is somewhat similar in that both are RTL-SDRs with onboard computing hardware and WiFi connectivity. The Dreamcatcher is not yet for sale, but it is currently under production. From the looks of the discussion on the forums, it looks like it will sell for $149 USD. Outernet have said that they are sending us a review sample, so keep an eye out for the review in the coming weeks. The Outernet Dreamcatcher: RTL-SDR + LNA + Filter + Computing Hardware on a single PCB. How do I get outernet to work with dreamcathcer? Can someone please list the steps? Outenet’s Chris Shirley said to “follow some instructions”. BUt I get the board and.. No instructions. I have no idea what to do. Can someone please help? Can someone explain the advantages of this vs a regular rtl-sdr dongle with RPI? That would cost around $60 and have a more capable compute platform at a slightly larger form factor. The board includes the LNA and SAW filter for Outernet, and I believe the price includes the patch antenna too. Still cheaper to DIY it, but depends if you want convenience or price. don’t forget the on board GEO sat receiver dual stage low noise amplifier, which is the key part for Inmarsat, Outernet, etc. sat work. The board will include 512MB RAM. The wifi dongle supports STA + AP.